LiveCode LessonsData GridLiveCode Data Grid Working With Data Grid TablesHow Do I Sort By A Column? Select the data grid and open the property inspector. 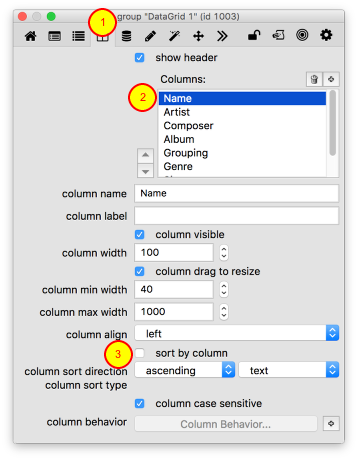 Navigate to the Columns pane (1), select the column you want to modify (2), and check the Sort by column checkbox (3). You can sort by column setting the dgProp["sort by column"] property of the data grid to the name of the column you want to sort by. set the dgProps["sort by column"] of group "DataGrid" to "Name"
Prev: How Do I Change Column Alignment? Next: How Do I Resize Columns?